Portable Eyewash Station - these self-contained units are 100% portable and come with an eyewash and drench hose unit. With a large water tank, workers can rinse their eyes, face or body. 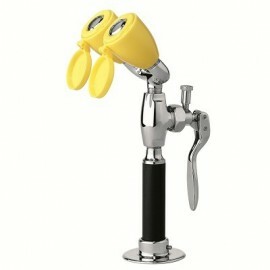 A portable eyewash shower station can also be refilled with the proper eye-washing solution and reused many times. These units are perfect in work area where a continuous supply of water is not available. 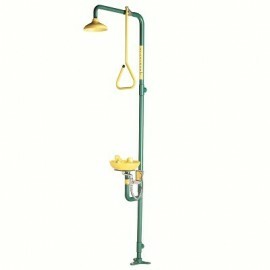 Combination Shower / Eyewash Station - these all-in-one units are plumbed into a continuous water supply and have a fully functioning emergency shower and eye wash station. These units require little maintenance, since there is not water reserve to change out, but require weekly activation to verify proper functionality and to help prevent the buildup of sediments, mold or bacteria. Combination units are ANSI Z358.1-2004 certified and are perfect for chemical processing plants, factories, manufacturing, agriculture and other work environments where workers are exposed to harmful materials.